Thanks to instant messaging, Veggie Girl is just a few clicks of the keyboard away. So she gave me some suggestions as to what to do with the ribs and we both agreed that this was the best choice. Thanks Veggie Girl for enlightening me once again. This is so quick and simple, I cannot believe I never thought of it before. It's so simple that you don't need to measure anything. The ribs can be any amount. Just make sure you have enough sweet chili sauce to drizzle and coat it with. 1. 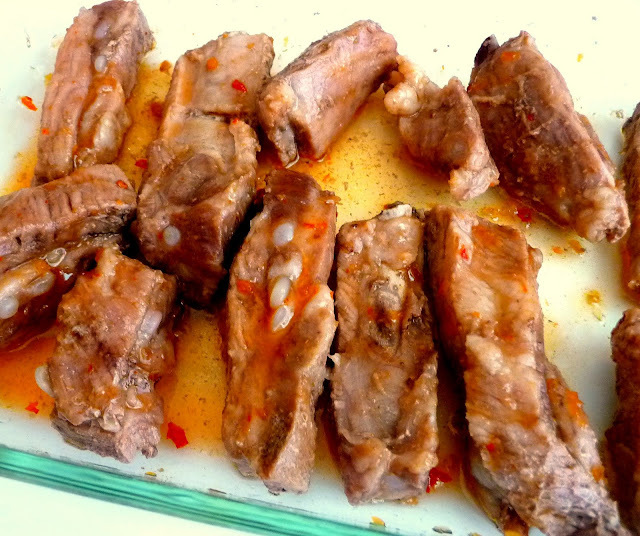 Place ribs in a pot with just enough water to submerge the ribs entirely. Using low heat, boil the ribs for about an hour or until tender. 2. Remove the ribs from the pot and place ribs in an oven safe dish or baking pan. Drizzle and coat the ribs on all sides with the sweet chili sauce. 3. Broil the ribs in the oven on high setting for about 5 minutes or until it starts to turn golden brown. Flip the ribs up side down and broil again for another 5 minutes or until it starts to turn golden brown. Be careful not to overbroil or the meat will dry out and get tough. 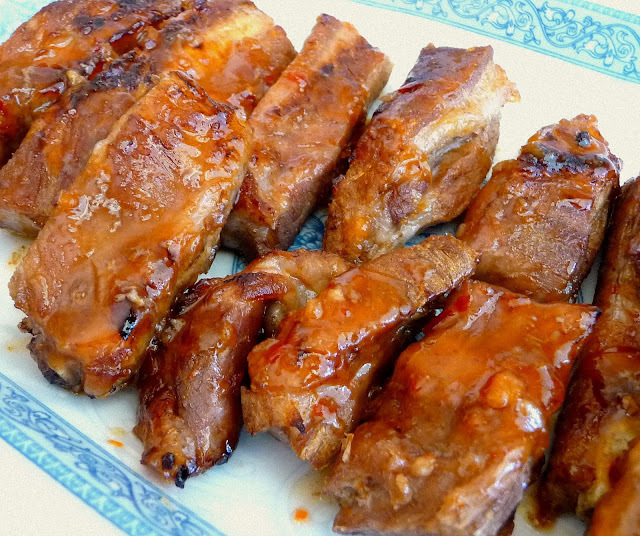 Drizzle and coat the ribs with sweet chili sauce before broiling.